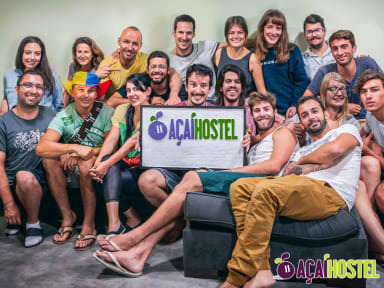 Açaí Hostel Salvador v Salvador, Brazílie: Zarezervujte nyní! From the hostel you need to walk just a few meters to find all the history of Brazil’s first capital (1549 – 1763), with its well preserved Renaissance buildings, churches and squares. But these are not the only attraction, Pelourinho is full of life, with different music playing from every house, street or restaurant you pass by. Artists in the street will offer you their paintings, sculptures, clothes, shoes and an infinity of Bahian souvenirs. During the night, specially on Tuesday, there are many bars, squares and (again) loud music playing across the streets. After travelling the world and Brazil, we identified that our country still misses good hostels. Most of them were in bad shape, with shaking beds, dirty old linen, broken walls and bad toilets. We strongly believe that when you are backpacking, having a comfortable clean place to stay is essential to recover the energy spent during the day (or night). So we decided to do like the Portuguese and start by Salvador opening a good hostel, but without missing the historical atmosphere that Pelourinho brings and, MOST IMPORTANT, without missing the backpacker atmosphere: like you, we can`t wait to know new people from different parts of the world, hangout and have fun together! - Bookings must be cancelled or changed 48 hours before check-in in order to be free of charges. - We don't have Private Rooms. - All bathrooms are MIXED, shared and split by cabins. - The minimum age to stay at the hostel is 18 year old and the recommended maximum is 40 year old (or to feel like under 40 ;-) ).